How do we reconcile these two facets of God? [audio:http://www.truthrevolution.tv/show/TS-0322.mp3]No Flash Support? Use this Audio Player! Dave: Why is God referred to as merciful, when in the Old Testament he was constantly destroying people? Jeff: We have to look at the facts, and then let’s come to the conclusion about whether God is merciful or not. Dave: Fact #1 – God is our judge. Jeff: Humans are judged by judges on a regular basis. It’s fair, and we call it the justice system. Dave: That word “justice” implies punishing wrongdoers. And God is our judge, in the Cosmic justice system. Jeff: Fact #2 – The Bible never depicts God as doling out destruction against people without first giving them chances to repent. Dave: If you read the Israelite history in Egypt, you’ll find that God waited 400 years before finally using Israel to execute judgment on many of the nations. 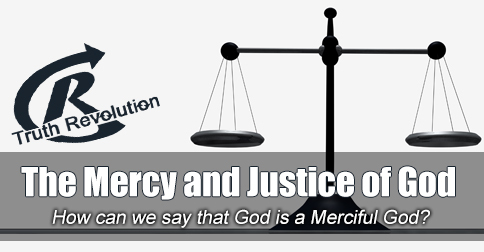 Jeff: Fact #3 – Even when punishment was pronounced, there are plenty of instances of God stopping the penalty if someone just asked for mercy! Dave: Put those together: a judge who waits 400 years to judge and won’t punish if someone just asks for forgiveness! Jeff: That sounds pretty merciful to me.